You are currently browsing the tag archive for the ‘Minnesota Vikings’ tag. On December 24, 2011, Minnesota Vikings running back, Adrian Peterson ruptured the anterior cruciate and medial collateral ligaments in his knee. It was a shocking injury that ended his season and normally results in a significant recovery time of over a year. 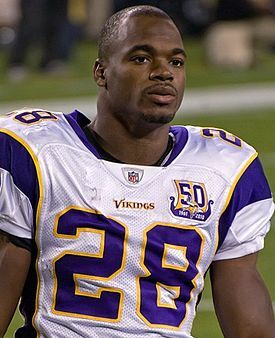 Adrian Peterson didn’t just come back within 8 months, he was a popular and worthy winner of the NFL’s Most Valuable Player award for the 2012 season after falling just 9 yards short of breaking the NFL all-time rushing record. How did he make such a remarkable comeback and why is he such an inspiration? Peterson himself humbly suggests that genetics played a big part and that may be true to an extent, but I suspect that there was more to it than that.